The Courts Administration Authority in South Australia issued a grim warning to fine evaders in 2000 with the suggestion that fines might be extracted through surgery. 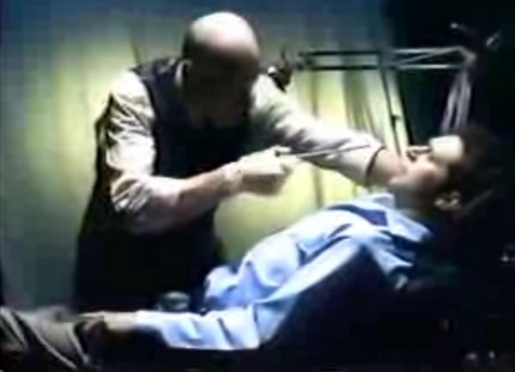 A surgeon is shown removing a driving license through a Mr Philip Nelson’s nose, a wallet from his nostril, and a television, maybe even a car. “Pay Through The Nose” was so gruesome it was almost funny. Pay Through The Nose was developed at Leo Burnett Robinson, Adelaide, by creative director Jim Robinson, art director Mark Busse and copywriter Strephyn Mappin. Filming was shot by Nick Robertson via Radical Media, (now at Plaza Films) with director of photography Nick Mayo and producer Peter Kearney. Post Production was done at Videolab, Sydney. Editor was Danny Tait at The Tait Gallery, Sydney. Eerie music was provided by Sound Reservoir, Sydney.